Lambert-Eaton syndrome, also known as Lambert-Eaton myasthenic syndrome, is a condition in which the immune system attacks the neuromuscular junctions — the areas where your nerves and muscles connect. 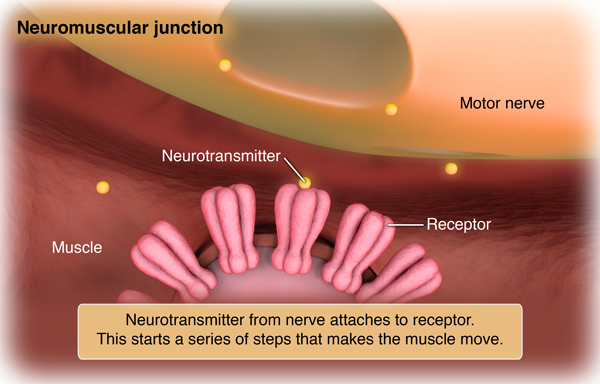 Normally, your nerve cells pass signals along to your muscle cells. These signals help your muscles move. Because Lambert-Eaton syndrome affects the way your nerves and muscles communicate, making it difficult to move your muscles as you normally would. In some of the remaining cases, Lambert-Eaton syndrome develops following another autoimmune disease. Sometimes the cause is not known. If your healthcare provider finds that you have this condition, you'll be checked for lung cancer and other cancers, such as lymphoma. If cancer isn’t found at first, you may need regular check-ups to keep looking for an underlying cancer, as Lambert-Eaton syndrome may appear as much as 3 years before a cancer diagnosis. Can Lambert-Eaton syndrome be prevented? Avoid exposure to tobacco smoke. Have your home checked for radon. Symptoms of Lambert-Eaton Syndrome may become worse when you're warm or have a fever. As a result, avoid taking hot showers or baths and contact your healthcare provider if you start developing signs of a cold or the flu. Exercising on a regular basis and getting enough sleep may also help you manage your symptoms. If there is an underlying cancer, finding and treating it is the first priority, and may improve symptoms from this condition. Other treatments include drugs to suppress the immune system or to help strengthen the signals between the nerves and muscles. Primary Progressive Multiple Sclerosis Thyroidectomy What Are Common Symptoms of Autoimmune Disease? Autoimmune Disease: Why Is My Immune System Attacking Itself? What Are Common Symptoms of Autoimmune Disease?